Tomorrow (Saturday, October 19th, 2013) is a busy day for Californians interested in nuclear issues! In San Clemente there is the Citizen's Nuclear Waste Symposium. Attached is my brochure (in pdf form) for that symposium. Many thanks to Mary Fish and staff for help putting the brochure together. The symposium, featuring nuclear waste experts Arjun Makhijani and Marvin Resnikoff, will be webcast live, and also recorded for later rebroadcast. Go to SanOnofreSafety.org for more information about the San Clemente symposium. Also tomorrow, in San Francisco, is a Fukushima Awareness conference, and more information on that is included below and in the second attached pdf. Speakers will include Dr. Robert Gould (Physicians for Social Responsibility) and Prof. Masaki Shimoji, who was jailed in Japan for protesting the burning of radioactive Fukushima rubbish. I heard from a San Onofre whistleblower today, who told me he has learned that Unit 3 operated at higher pressures than Unit 2 -- the opposite of what we had thought! He also said the boiling in Unit 3 began at the very bottom of the steam generator, near the tube sheet (much lower than it should have). He noted that even today, he doesn't think anybody really knows why Unit 3 suffered Fluid Elastic Instability, and Unit 2 did not. Japan and the world continue to be threatened by the Fukushima meltdown and further contamination of the land and sea as well as a growing cancer epidemic of children, workers and the people of Japan. The conference will challenge the information being propagated that we can overcome radiation and that Fukushima can be decontaminated. Saturday, October 19, 2013, 1:30 - 4:30 p.m. In June, civic and environmental activists won a big victory when the troubled San Onofre nuclear plant ceased operations permanently. The current dispute over defective technology between Edison and Mitsubishi confirms how necessary this outcome was. Environmental and citizen groups had only a short time to celebrate averting the risk posed by continued operation of the plant. Almost immediately it became clear that this site, wedged between Interstate 5 and the Pacific shoreline, poses a huge challenge of radioactive nuclear waste stored at the plant. The issues are multiple. Much of the waste is a highly radioactive form of spent fuel known as "high burn-up," stored in densities far higher than original design specifications. Large uncertainties persist about where the waste will ultimately be stored and for how long. Billions of dollars of expense will be required to resolve these uncertainties. The issues involved in "decommissioning" San Onofre were secondary during the shutdown debate but now they loom large. Co-sponsors of the symposium include Residents Organized for a Safe Environment (ROSE), Sierra Club Angeles Chapter, Peace Resource Center of San Diego, San Clemente Green, Women's Occupy, Citizens Oversight Project, and San Onofre Safety. Our immediate goal is to assure that "best practices" are applied to make the decommissioning of San Onofre as safe as possible. Our ultimate goal is to rejuvenate the national dialog about how the U.S. manages nuclear waste. Learn more on the San Onofre Campaign website, email list, and Facebook page. The correspondence below has only been very slightly cleaned up. At one point I had written "0.01%" but that has been adjusted to a more accurate (I believe) 0.000001%. A few typos have also been corrected. The estimates (a thousand times this, a hundred times that, etc.) are believed to be reasonably accurate. Please bear this in mind while reading my comments. Regarding my wife's biopsy mentioned in my original cover letter (also shown below), the lymph node tested positive for cancer. That makes five cancer spots, but four have been removed (three in the breast and one lymph node). After a couple of months of chemo, the remaining cancerous lymph node will be treated with radiation, and then she'll get hormone therapy for five to ten years. The odds are still in her favor for a five year survival, or much longer, but the next few months are going to be rough. Below are my comments on the attached notes. I hope people find them useful. I have not had time to proofread them and feel it is urgent that I get them out before the meeting today. Question thirteen and related questions are probably the most important ones. Sorry if these comments offend anyone, that is not the intent. The intent is to help us all face the reality of what the real dangers are from our nuclear mistakes here in America. My wife gets the results of her most recent post-mastectomy biopsy today, in about an hour and a half. I want to thank the NRC staff and others who have wished her well. She had a radiation-guided biopsy on Wednesday, a radiation-guided mastectomy on August 30th, and will almost surely be told she'll be getting radiation and chemo when we meet with the oncologist this morning. It has always been my goal to take a reasonable approach to radiation dangers, and I hope the rest of you will, too. Question 1: (from the Coalition) Is the NRC willing to recognize The Coalition to Decommission San Onofre and grant us official status? Will the public have an opportunity to review and comment on significant decommissioning plans, including planned expenditures? Answer 1: (Camper) We will consider this request. What would it involve? Response: (Gene Stone on behalf of the Coalition) It would involve the Coalition providing citizen oversight and an independent perspective during decommissioning. The Coalition would be an active participant on safety issues, including joining the NRC during on-site inspections. This role would assure the openness of process sought by the NRC chair. 1) A "citizen's oversight" on the decommissioning process is practically irrelevant. More useful would be to analyze the one they have at Diablo Canyon and try to be a part of it instead, if someone's dying to be on such a thing. Diablo Canyon is about 1000 times more likely to cause harm right here in Carlsbad, and more so in San Clemente, than even our spent fuel, because it's hot, it's running, and it's on an earthquake fault in a tsunami zone. It's got all the problems we had at SanO only it's still got 'em. Question 2: (from the Coalition) We were told by the NRC recently that high burnup has been used at San Onofre since 1996,. We cannot find a public notice of that from the NRC or SCE. The union and other workers we have talked with were not aware of its use. Was notice ever given to the public and workers? Were workers made aware that this high burn-up fuel is more than twice as radioactive? Answer 2: (Spitzberg) San Onofre has been authorized to use and store high burnup fuel. It does have to remain in pools longer than conventional fuel for cooling – 7 years rather than 5. High burnup fuel will not be transferred from pools to canisters (casks) until this is certified as safe. 2) I'm sure the workers who handled the fuel knew it was high burn-up and much more radioactive. I don't recall if Lyn, Sharon or I knew about it, but if I run across anything on the subject in my notes I'll let you know (what little goes back that far, other than my own LTEs that were published). What does go back in my documents shows that all the professionals were telling the public that dry cask storage would be "temporary." No one should be fooled thinking dry casks are "temporary." They are the most important containment system the fuel will ever have because they hold the fuel while it is the most dangerous. I disagree with the 7 year figure for high burn-up's time in the pools; I think NRC's own experts are saying, generally, it's 15, and the NRC's own charts that Donna's dug up also suggest it will be 12 to 20, but not likely to be only 7. Perhaps our fuel is low-high burn up or something, so it can stay in the pools for less time. While lowering the density of pools will certainly increase safety, I am not convinced that removing ALL the fuel to today's idea of safe dry cask storage necessarily accomplishes the same goal. Our dry cask farm is NOT safe. Question 3: How does high burnup fuel affect decommissioning, including on-site cask storage, and how much high burnup is on the site? Answer 3: (Watson) The NRC collects data on spent fuel stored at the site. For any given facility, the amount is security-sensitive. The utility does not have to report on how much is stored. The NRC agrees there is no way to monitor the behavior of fuel in sealed casks. We are sponsoring a demonstration project with the nuclear power industry to determine if high burnup fuel can be safely stored in dry casks for more than the 20 years we currently approve for the advanced cask model 24 P holding conventional nuclear fuel. In 20 to 25 years we will know more about the technology of casking. For the record, the standard threshold for high burnup is 45 gigawatt days per metric ton of uranium. This level depends on the time the fuel is used at full power. (Camper) There is a lot of interest in the characteristics of high burnup. We will make it a future topic for a public hearing. Nearly 20 years into its use, it seems the NRC is a little behind in finally sponsoring a demonstration project to discover the potential hazards of long-term storage. This possibility was always on the table that long-term storage might be necessary and it should never have been assumed that it would be safe. It was never logical to assume a great nation like ours would find a desolate, unloved, ignorant enough, poor enough site for a national repository whose roof would leak onto 2-inch thick titanium over-shields and render the area unapproachable within a few centuries. Yucca Mountain was able to be stopped politically because eventually it was going to be stopped on technical grounds anyway. I am delighted to hear that high burn-up fuel will be the subject of a future public hearing. Also nearly 20 years too late, though. Question 4: MOX fuel has some characteristics of high burnup fuel. We understand that MOX was removed from San Onofre and shipped to the GE Morris facility. Does this create a precedent for shipping high burnup fuel? Answer 4: (Camper) Some fuel units were removed from San Onofre between1972 and 1982 but MOX fuel was not among them, nor was MOX fuel ever shipped to GE Morris. It is still stored at San Onofre. 4) MOX is fuel with additional Pu-239 in it. After burn-up it also has Pu-238, Pu -240, etc. etc.. These isotopes are both extremely hazardous -- even more so than Pu-239, but for comparably less time (Pu-238 half life is ~87.7 years; that of Pu-240 is 6563 years). This is by far the "best" dirty bomb material at San Onofre, and should have been removed to a militarily-defended location long, long ago. Leaving it here for decades sounds like negligence to me. Question 5: ([Former] Mayor of Mission Viejo) Were there any problems with decommissioning Unit 1 and have NRC regulations changed since then? Answer 5: (Watson) The decommissioning of Unit 1 was somewhat unique in one respect. We did a partial rather than unconditional release of the site because we determined that removal of the seawater intake would be more environmentally disruptive than keeping it in place. (Spitzberg) The Unit 1 license has not been terminated because the reactor vessel is still on-site. I was Branch Chief during the Unit 1 decommissioning. The process went smoothly with the exception of one significant violation – leakage of liquid waste at a truck stop in Utah, which involved a citation. 5) The containment, too, should have been left alone, at least for a few decades, but they "needed" the room for the dry casks. Demolishing many parts of a decommissioned reactor simply spreads the radiation around and serves no useful purpose. Question 6: Were there health impacts as a result of the radiation release? Answer 6: (Bob Evans, NRC Senior Inspector) The Utah leak was in 2006. The release was cleaned up on the spot. (Watson) The NRC enforces regulations on transport. Waste cannot be transported in liquid form above a low level of radiation. However, we treated the spill as significant. Question 7: How will the use of money from the Decommissioning Fund be monitored and what will be the end goal of the process? Answer 7: (Cynthia Walker, California Public Utilities Commission) The CPUC has oversight of decommissioning funds. Edison will file a plan and we will release funds for each stage. The site agreement with the Navy calls for greenfield status, for which California has requirements in addition to those at the federal level. 7) "Greenfield"? We're dreaming, right? And no mention of the spent fuel. Question 8: What is the role of the California Energy Commission in the process? Answer 8: (Rob Ogilsby, Executive Director, California Energy Commission) CEC's focus is on a reliable electricity supply in the absence of San Onofre. We restarted an old non-nuclear power plant in the summer of 2012 when San Onofre shut down. Now that it is permanently closed we are developing plans for reliable power. 8) No mention of a push for local solar rooftop incentives, offshore wind farms, demand-response, pumped-water energy storage, atmospheric vortex engines, a smart grid, or getting rid of SCE entirely and replacing them with community choice? Question 9: Who authorizes the use of high burnup fuel? Answer 9: (Chip Cameron, NRC moderator) At the meeting in 10 days on waste confidence, I'll ask Paul Mitchelak from NRC about this matter. At that meeting we can discuss the generic environmental impact statement on spent fuel storage that NRC is developing as a national document. We are currently in the public comment period. (note: the October 9 meeting referred to was cancelled on October 3 due to the government shutdown and has not yet been rescheduled). 9) The Spent Fuel issues are thousands of times, even millions of times more important than the whole rest of the "decommissioning" process combined. Yet it's mysteriously referred to as being in the "non-nuclear" or "non-radiation" portion of the decommissioning process in official NRC documents! One spent fuel rod, probably one spent fuel pellet -- contains more radiation hazards than the entire rest of the reactor. Question 10: Given San Onofre's unique site characteristics, shouldn't there be a site-specific environmental impact statement for this facility? Why was high burnup approved for San Onofre without credible proof that the long-term effects would have no measurable impact? Answer 10: (Spitzberg) The heat level and the type of assemblies are reviewed by NRC specialists with regard to the type of cask proposed for storage. Historical data on the performance of specific designs is used to evaluate their appropriateness. (Doug Brodis, NRC Office of Reactor Regulation) In the licensing process for fuel, the operator applies to use fuel and the manufacturer designs the fuel. A site-specific amendment request would be required to use that fuel at a particular plant, and there would be an opportunity for public comment. 10) The NRC experts are saying there was no data for long-term storage of high burn-up fuel. Therefore, Spitzberg's answer is inaccurate because there was no relevant historical data. And is Mr. Brodis, NRC ORR, saying there were "hearings" in 1996, or just a notice in the Federal Register, or what? Question 11: (Dale ----) Have we learned the lessons of Fukashima? Why is it that while the entire coast of Orange County is rated as tsunami-ready, San Onofre is qualified only as storm-ready? Don't the cooling ponds in particular need to be moved inland? 11) There were many lessons from Fukushima, including that human failure is an inevitable factor in emergencies, in preparation, in "standard operating procedures," in record keeping, in clean-up, and in every other phase of every operation (including letter-writing). NRC has the audacity to believe that every part that is shipped to every reactor has been properly manufactured to NRC-licensed specifications. This absurdity is blatantly described, right in the SanO special panel's own documents (the panel that was recently and inappropriately disbanded). Another lesson that should have been learned is that clean-up of a melted-down reactor is a far more difficult process than the NRC anticipates, and that the Price-Andersen Act needs to be adjusted accordingly. Question 12: (Larry Kramer, San Juan Capistrano City Council) It has been noted that the Unit 1 reactor vessel is still on site. Will the same be true with Units 2 and 3? Answer 12: (Spitzberg) Spent fuel remains as well. Unit 1 was shut down in 1992 and surface structures related to spent fuel were removed but sub-surface structures are still there with low-level waste. This is a case of "phased decommissioning." (Watson) Edison will have to determine how to handle the large components. Trojan barged its on the Columbia to Hanford, Washington. Yankee shipped its by sea to South Carolina. Question 13: (Marnie Mangen, Laguna Beach City Council) The tsunami danger is great. Spent fuel pools are an accident waiting to happen. How do we get the NRC involved so the process doesn't take 60 years? Have you licensed any type of cask for transport? Answer 13: (Spitzberg) In reply to the question are casks transportable, models 24 PT 1 and 24 PT 4 have been so certified. 32 HP 2 has not yet been certified but Edison has applied for this. (Camper) We review and ask questions regarding the PSDAR (Post-Shutdown Activities Report but there is no requirement that the NRC approve that report. The activities involved in decommissioning were evaluated as part of the EIR (Environmental Impact Report) during the original license review and approval. The 60-year time frame is to allow reduction of radiation levels by 99% and volumes by 90% so that transport of spent fuel is less difficult. 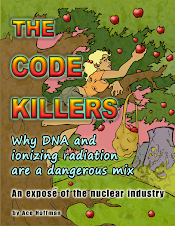 In both cases the key is rapid decay of one radioactive element - cobalt 60. A repository for high-level nuclear waste is a significant national issue. The Department of Energy is seeking sites. The NRC would issue the license. This is a very complicated national problem. 13) Referring to the lack of a national repository as merely "a significant issue" is still ignoring the fact that there is no solution to the waste problem, yet the NRC allows utilities to create more waste! As a Japanese university nuclear physicist said about Fukushima, it's like building a mansion with no sewage facility. No matter how nice the mansion is, how long would you live in it after the toilets backed up? Spent fuel serves no purpose to humanity yet has the ability to wipe us all out, destroy our homes, our property values, our DNA. It is about 10 million times more hazardous than "Depleted Uranium" -- a significant hazard in its own right -- and about a million times more hazardous than even so-called "high burn-up" fresh fuel. Transporting it raises significant hazards including accidents, mishandling, and sabotage. The pellets in high burn-up fuel have fused to the cladding and the stresses are completely different from what they would be if that had not happened. Any cladding failures will release far more fission products to the environment than for "regular" fuel. To refer to the lack of a national repository as merely a "complicated problem" belies the reality: There is no place on earth for spent fuel. So stop making more at Diablo Canyon and Palo Verde, too. Force Southern California Edison to take back ownership of the spent fuel it created and creates at Palo Verde, of which is a part-owner. If the federal government stopped taking legal possession of spent fuel, every reactor would shut down tomorrow. But the feds take it with nowhere to put it. Reprocessing is preposterous. Answer 14: (Watson) Yankee is absolutely clean. At San Onofre, ground water is monitored to detect any leaks. 14) Incomplete response from the NRC, especially insofar as, the area under the domes probably has leaked tritium, and has not been monitored and won't be until the domes are removed. Question 15: (from the Coalition) Will the NRC allow the resale of non-radioactive equipment and secondary side components, some of which are almost new? If they are sold, will the proceeds go to offset the cost of decommissioning.? Answer 15: (Cynthia Walker, CPUC) The NRC is not involved in the sale of non-radioactive materials. The PUC is involved. It is out intent that proceeds from the sale of any such items would be applied to offset the cost of decommissioning. 15) What is the definition of "non-radioactive," expressed in milliSieverts or some other numeric value? Question 16: (from the Coalition) Will public announcements be made whenever any "allowable" toxic waste is to be released into the environment. What the upper limits are for releasing radiation and toxic chemicals during the decommissioning process? When were those limits established and what would trigger a process to reevaluate those limits? Answer 16: (Watson) Regulations on [monitoring] releases are decades old. They apply to decommissioning. The NRC monitors releases that are radioactive. Others are based on state permits. 16) Radiation is far more dangerous, especially to fetuses, infants, children and women, than was believed decades ago. Ergo, one would assume the regulations which are decades old are far more lax than they should be. Question 17: (from the Coalition) Will the NRC have staff on site during decommissioning? Answer 17: (Watson) We will have a full-time senior inspector on site during decommissioning for a year and perhaps longer. 17) I think a year is very optimistic of the NRC considering that SCE doesn't even need to submit a plan until 2015! And I think all ISFSIs should have onsite NRC staff for when something finally happens, as is bound to occur sooner or later. Can't look inside? That's pretty poor planning, too. Question 18: (Marsha Padd) What are the safeguards addressing security risks that could endanger the integrity of the plant? Answer 18: (Spitzberg) There is a security force on site and there are security systems. (Camper) Spent fuel will remain on site for some period either in pools or dry casks. Most waste is low-level class A and a small portion is Class C, which is in canisters. Level A can be treated at facilities in Utah and Texas after USDOT-approved transport to a commercial facility. (Watson) An aircraft hit on a nuclear plant has been significantly studied. A drone hit would be well within the parameters that the facility could withstand. 18) The spent fuel is the part that needs a significant security force. Instead it will have one guy with a pop gun. Question 19: (questioner name) Have the effects of climate change on sea level been evaluated in its impact on major ocean storms that might impact San Onofre? Answer 19: (Camper) The effects of climate change would be part of our generic Environmental Impact Statement. In the case of San Onofre, this relates primarily to the use of equipment on site that emits greenhouse gases. 19) Nineteen was not answered in any way by the NRC. Greater-than-previously-anticipated tsunamis should be expected and dealt with by removing the spent fuel to a safer location. Question 20: (Ray Lutz) Given its importance in terms of both economic and environmental impacts, why doesn't the NRC sign off on the PSDAR? This seems like a significant gap in the process. Answer 20: ((Watson) The rationale for why the NRC does not approve PSDARs came from the Commission itself as a policy decision, the basis of which was that decommissioning could be done safely under the existing license because the operational phase covered by the license is inherently more dangerous and requires a higher level of risk management. 20) Spent fuel makes the decommissioning process extremely risky and the decommissioning process is significantly different from operating a reactor. It can be (and is being) argued that special experts should be hired to do the decommissioning process, instead of SCE, who don't seem to be experts in much of anything these days. But hiring a whole different company should certainly require new licensing procedures. Question 21: (Ray Lutz) Is that an adequate level of oversight, given that decommissioning involves distinct risks that were not present during operations? Answer 21: (Watson) The process isn't over until the License Termination Plan (LTP) is accepted, and the NRC does approve this. The LTP is a critical part of decommissioning. 21) The License Termination Plan does not require "greenfielding" does it? Or removal of the spent fuel? Question 22: (questioner) What is the reason all nuclear plants have facilities for indefinite storage of dry casks ? Answer 22: (Camper) Since we have no repository that can handle spent fuel over geologic time, every decommissioned plant has cask storage on site as a response to this situation. There is not only no long-range site but no interim storage site. A high-level policy recommendation has been made to establish one or more interim sites. A Utah-based company was issued a license to do this but did not gain federal support on a rail line to service the site. Counties in New Mexico, Mississippi and South Carolina have all expressed interest in being designated as interim sites. 22) It is absurd to pretend a solution is forthcoming in Mississippi, New Mexico, South Carolina or anywhere else. ANY solution will involve a violation of people's basic human right to life -- which requires clean air, land, and water. No state governor will ever be elected who will allow his or her state to become the nation's permanent [solution] for nuclear waste. Violating States' Rights on this matter is not something the NRC can rely on. Therefore, presuming any solution is forthcoming is the height of absurdity. And that's not even considering that the Yucca Mountain scientific team was allowed to consider any other solution, except deep geologic repository somewhere other than at Yucca Mountain. There were and are no "better" solutions. There are no good solutions to the problem of nuclear waste. Question 23: (David Weisman, Alliance for Nuclear Responsibility) Could the movement of spent fuel from pools to casks be expedited? The California energy Commission has recommended this for years. The California Public Utilities Commission controls the use of decommissioning funds and could allocate some of them for this purpose. Shouldn't this be done? Answer 23: (Dusaniwskyj) The licensee must first decontaminate the facility. At that point, the NRC has no further jurisdiction. 23) Expedited transfer to dry casks will accelerate the problem of transfer out of dry casks into something better later. Our dry casks as currently designed are insufficient. Answer 24: (Camper) The Nuclear Energy Institute says the next bow wave of decommissioning activity will be in the 2035 – 2055 period, premised on all nuclear plants being decommissioned at some point. In the last 12 months, five plants have suddenly announced decommissioning. This has caused us to do a careful review of potential readjustments. 24) Let's hope the rest of America's misguided nuclear "fleet" is decommissioned far sooner than NEI projections -- starting with Diablo Canyon and Palo Verde on the west coast, and Indian Point, Oyster Creek, Salem, etc. on the East. Question 25: (Patrick -----------, Marine Corps Environmental Staff, Camp Pendleton) How does the NRC intend to coordinate with California state requirements as you move toward unconditional release of the site? Answer 25: (Camper) Some states, including Maine and Connecticut, have developed their own decommissioning standards. California could do the same in cooperation with the Marine Corps. We seek neither to prolong nor to expedite decommissioning but to adhere to the required process. Ninety percent of our budget comes from fee recovery from the nuclear industry. 25) I think the Marines would like their land back. I'm not sure they realize the hazards of using explosives near high burn-up fuel. Question 26: (Pete Dietrich, Edison Chief Operating Officer, San Onofre) The repeated reference to "greenfield" status in the NRC's opening presentation suggests that when decommissioned sites go on unrestricted release, they return to what appears to be natural open space. But isn't it true that in this case Edison must satisfy only the land use requirements of the U.S. Navy, which owns the land as part of an active military base? (Note: before the hearing began, Edison informed NRC staff that a group of its employees were in attendance and did not wish their presence announced nor questions directed to them but did reserve the right to make a closing statement). 26) Interesting behavior on the part of SCE staff. >Thanks again for the detailed response and rapid turnaround. I've received expressions of appreciation from several members of the Coalition. >We understand that NRC staff have only Friday and Monday and it will actually be illegal for you to continue working Tuesday and beyond due to the government shutdown. >Because of this situation, I'm getting to you ASAP the companion document to the one you just reviewed. It summarizes the Q-and-A at the evening session on September 26th. >It would be terrific if your group at NRC could get back to us with a similar response. Given the short timeline you face, we will certainly understand if that's not possible. >draft with key members of our working group as well as with you and Larry and Bruce. Please pass it on to Blair and Mary Woolen as well. >is in cold print, a number of replies seem pretty much complete but others are less satisfactory or even a bit off topic. If you wish to close the gaps and fill in the blanks, feel free. >I apologize to you and to the citizen rep's I'm sharing this with for any errors in identifying questioners and respondents, and any misstatement of questions as well as answers. >Thanks very much for joining us in this exercise in transparency as we all seek to move toward an environmentally safe and economically fair decommissioning of San Onofre. >I am replying to your request on behalf of Mr. Camper. Attached is a copy of your meeting summary that has been reviewed by the NRC presenters and other NRC attendees of the public meeting on decommissioning. Our suggested edits are noted in red. Please let me know if you have any questions regarding any of the changes. >I enjoyed our brief visit after the meeting of NRC staff and public representatives in Carlsbad last Thursday morning. >based on the hard copy of power point you provided plus my notes of verbal comments made by team members as they presented. >For the record, none of this text was done by electronic transfer. I entered this entire document on the keyboard. >later this week that will summarize questions and answers during the morning and evening discussions. >Thanks for facilitating NRC input on the attached document.